A primary goal of this priority program is to manage Austin’s urban and natural ecosystems in a coordinated and sustainable manner in part by increasing protection of environmentally sensitive land, improving tree cover in every neighborhood, improving health of the watershed, increasing access to parks, and linking these resources throughout the city. This program seeks to improve environmental, recreational, and transportation functions and improve the connection between people and the environment. 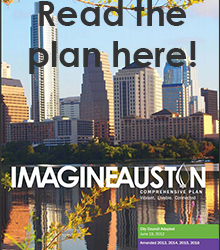 For additional information about this priority program, see page 194 of Imagine Austin, or contact the Planning and Development Review Department liaison. Given the wide range of policies, actions, and priorities related to green infrastructure in the Imagine Austin Comprehensive Plan, the Green Infrastructure Priority Program was organized into three groups with specific issues that they each tackle: open space acquisition, regulatory policy, and public lands management. There has been considerable progress made in each of these three areas that have moved the Green Infrastructure Priority Program closer to achieving the goals of Imagine Austin.